A few new exciting Spring books recently arrived in the mail, so I thought I’d update you all with the current status of my “To Read and Review” stack. The Seven Madmen is still on this list, where it’s been for about a month — major releases keep coming out that have de-prioritized this one, but I’m very much enjoying what I’ve read so far. I’m looking forward to the whimsical Stork Mountain which is being hailed as Don Quixote-esque tale of rural Bulgaria, and I’m pleased to put some nonfiction onto the pile (for a change). 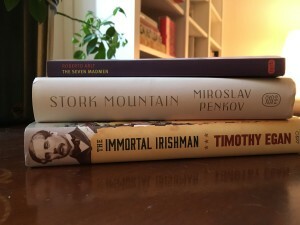 I found Timothy Egan’s The Worst Hard Time to be an essential book of American History and have high hopes for The Immortal Irishman.